On May 9,2015, the Berkeley Arts Council will sponsor the first local en plain air painting event as part of the annual Heritage Day celebration in Martinsburg. 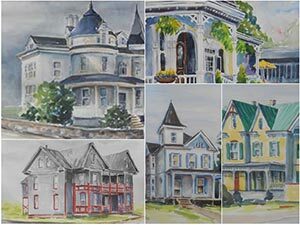 Artists from the region are invited to paint outdoors on site in Martinsburg on that day. Painting outdoors, rather than in a studio, has a long tradition in art dating from the early 19th century, when paint first became available in tubes, and is probably is most associated with the Impressionists. The natural light and vivid colors of nature are best appreciated and captured at their source. On this occasion, painters will set up in town, and passers-by will be welcome to watch them as they work. Those who have paid the $10 entry fee, will be eligible to win a $100 prize awarded to the artist who wins the most votes from people who see their work. In turn, people who fill out a ballot to vote for their favorite artist or painting, will be eligible to win their choice of paintings donated by the participating artists in a drawing at the end of the day. The participating artists will have their work exhibited at the Berkeley Arts Council’s gallery, Berkeley Art Works, during the month of May. There are covered locations available in the event of inclement weather. For additional information or to register for the event, please visit the Berkeley Arts Council’s web site at http://artworks.berkeleyartswv.org/pleinair/.